Short-term maximum intensity performance, absolute and related to body mass, is lower in children than adolescents. The underlying mechanisms are not clear. We analysed Wingate Anaerobic Test (WAnT) performance and metabolism in ten boys (mean (SD); age 11.8 (0.5) years, height 1.51 (0.05) m, body mass 36.9 (2.5) kg, muscle mass 13.0 (1.0) kg) and 10 adolescents (16.3 (0.7) years, 1.81 (0.05) m, 67.3 (4.1) kg, 28.2 (1.7) kg). Related to body mass, power of flywheel acceleration (6.0 (1.6) vs. 8.1 (1.1) W kg−1), peak power (10.8 (0.7) vs. 11.5 (0.6) W kg−1), average power (7.9 (0.5) vs. 8.9 (0.7) W kg−1), minimum power (6.1 (0.7) vs. 6.9 (0.9) W kg−1) and anaerobic lactic energy (687.6 (75.6) vs. 798.2 (43.0) J kg−1) were lower (P < 0.05) in boys than in adolescents. Related to muscle mass the change in lactate (0.69 (0.08) vs. 0.69 (0.04) mmol kg MM −1 s−1) and PCr (0.60 (0.17) vs. 0.52 (0.10) mmol kg MM −1 s−1) were not different. The corresponding oxygen uptake (1.34 (0.13) vs. 1.09 (0.13) ml kg MM −1 s−1), total metabolic rate (132.4 (12.6) vs. 119.7 (8.5) W kg MM −1 ) and PP (30.5 (2.6) vs. 27.5 (1.7 W) kg MM −1 ) were higher (P < 0.01) in boys than in adolescents. 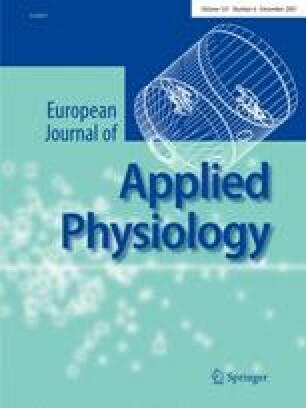 The results reflect a lower relative muscle mass combined with no differences in muscular anaerobic but fascilitated aerobic metabolism in boys. Compared with adolescents, boys’ performance seemed to be significantly impaired by flywheel inertia but supported by identical brake force related to body mass. The authors gratefully acknowledge the assistance of M. Jung in subject recruitment and data collection.